PUBLISHER: H. B. Nims & Co., Troy, NY, 1892-1897? 1884 PTLA: Remainders. We are making the handling of remainders a more prominent feature of our business than ever before, buying in the very largest quantities, and often securing every copy in the market. Such stock we offer at low prices, securing to the trade many tempting bargains, which can be jobbed and retailed at a much better profit than regular stock. The list below includes only such stock as we have in large quantities. / We name the original prices at which the books were published, and our prices to the trade. From these prices a small discount will be made to the trade, and special net prices will be quoted for large lots.... Lucile by Owen Meredith. 8vo, paper, illustrated. Published at 50c. Reduced to ... 18. [1884 per NUC]: University of California at Irvine: reported as no longer in collection. 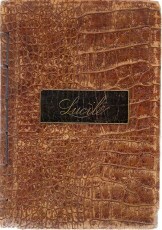 1885 PTLA: Lucile--Owen Meredith. Family Edition. 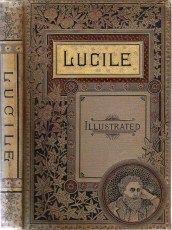 Fully illustrated, and uniform, with Family Editions of Longfellow, Whittier and Tennyson. 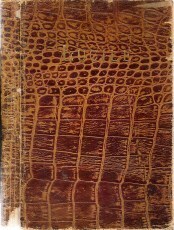 1 vol., 8vo, cloth, gilt, gilt edges... $2.50; 1 vol., 8vo, full crocodile, flexible... $4.00; 1 vol., 8vo, full American seal, flexible... $5.00. NUC NL 0594617 reports copies at Wayne State and University of Virginia; also at University of Illinois and Boston Public, neither still held.